I had great expectations for today.. but I woke up way too early ( thanks cat!!!) and couldn’t get back to sleep.. so I got up and started the tiny house entry on this blog.. and then I got inspired to bake chocolate chip cookies.. the kitchen was cleaned up by 7:30 am.. and then I came into school to resume work on the tiny house.. 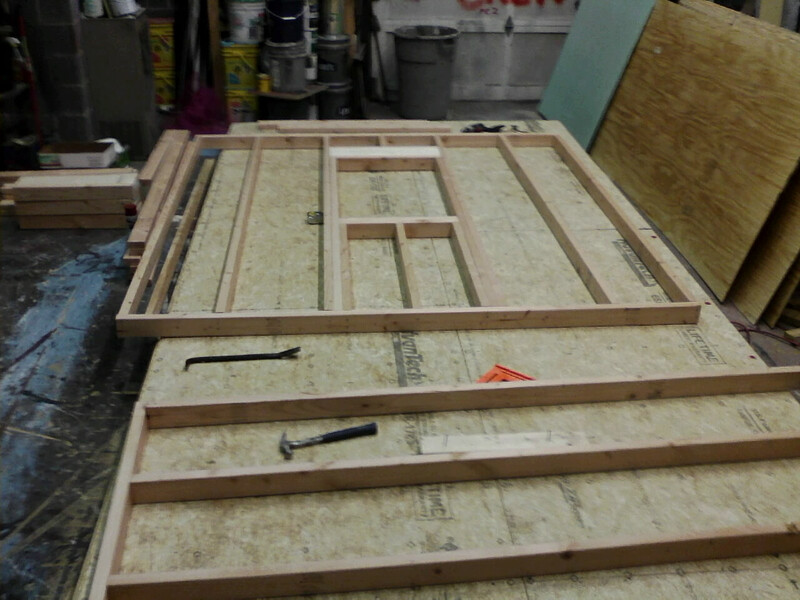 But it was a little slow today.. so I got the three sections of the back wall framed and sheathed and one side wall framed. I had hoped to get more done, but my body is telling me that it is time for a nap 🙂 No sense in sticking around here and hitting my finger with my hammer because I am getting tired.. I keep thinking about my compressor and nail gun at home, but I figured since I expected my students to use a hammer, I should do the same.. even though they are not here right now! I will save the nail gun for the interior finish work.. most of the interior will be wood, so the nail gun will be particularly helpful. I guess that I am pretty pleased with the progress so far.. Realistically, the walls should be framed and in position in another week and a half. 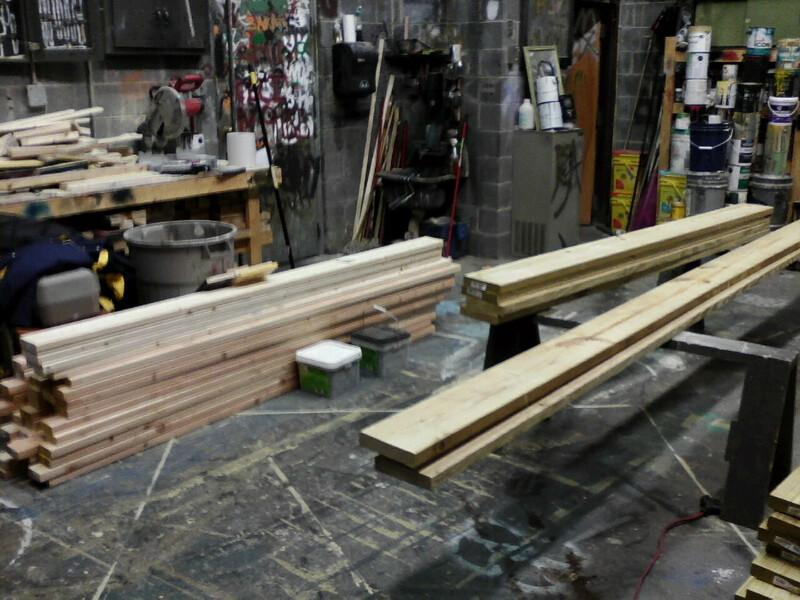 Then I will make the decision about whether to cut the rafters while we are still inside. That will depend on the weather and on how soon we can get the minimal site work done at the orchard. At the end of the school year, my wife will be leaving the classroom to join her brother on the family orchard. This is an idea that we have been discussing for 2 years or so, and it appears that now is the time to make the move! In many ways, it will be a new adventure for all of us, as we anticipate spending significantly more time, particularly in late summer and fall, at the orchard. In short, we need a place to stay over night on the farm. 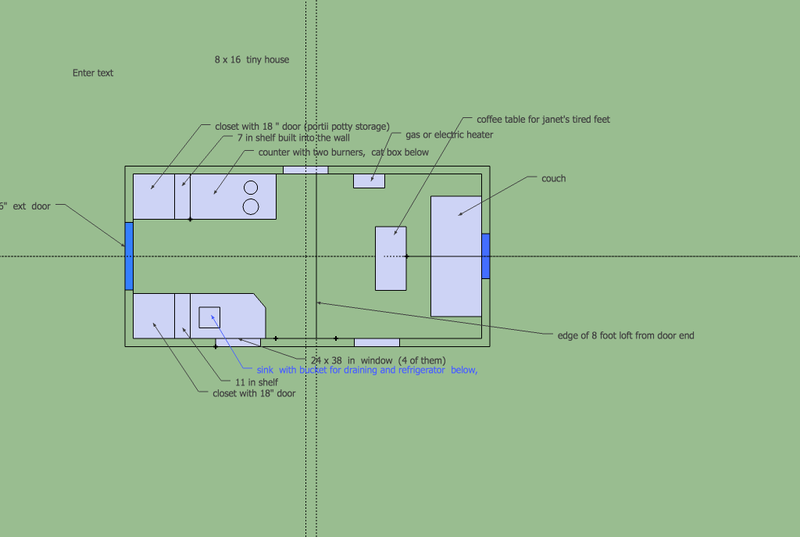 The solution… a tiny house! For a number of years, I have been following the tiny house movement, reading blogs about folks who are building tiny houses, often on trailers, and adopting minimalist lifestyles in exchange for greater financial freedom or simply to leave a smaller footprint on our fragile earth. Although I have been fascinated by the idea, I never thought that building a tiny house would be practical for us – until now! I turned to the stack of plans that I have been collecting over the years and pulled out one of the first set of that I ordered – probably 20 years ago. 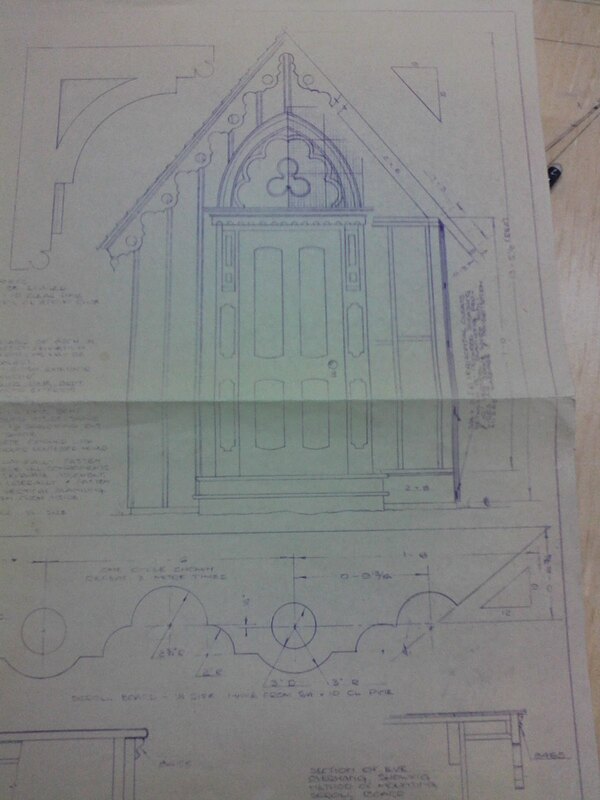 The design is for a child’s playhouse – 8 x 10 with a decidedly Victorian appearance. I bought those plans thinking that I might build the structure for my daughter. 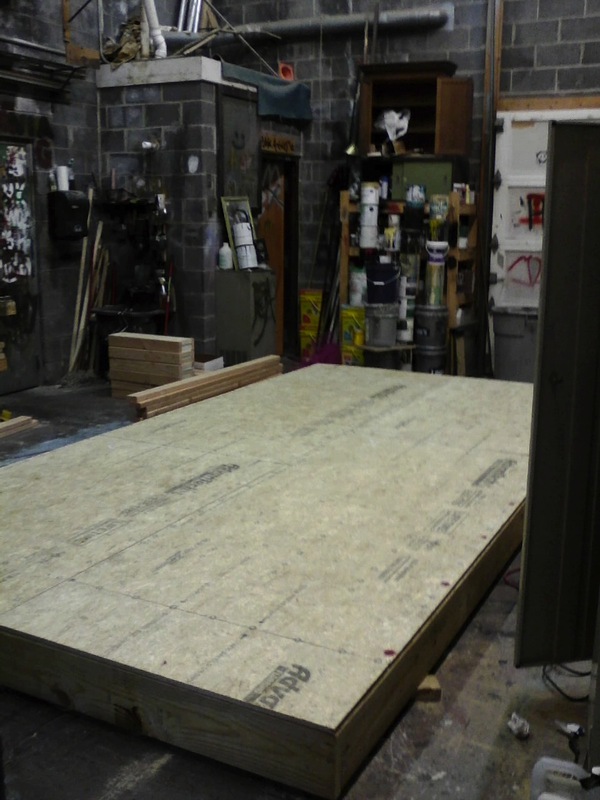 She is now 26 and hardly needs a playhouse, but… if we extend the footprint to 16 feet.. and that is exactly what we are doing! Our tiny house will not be on a trailer, but we will borrow many of the ideas that the trailerable houses have incorporated. 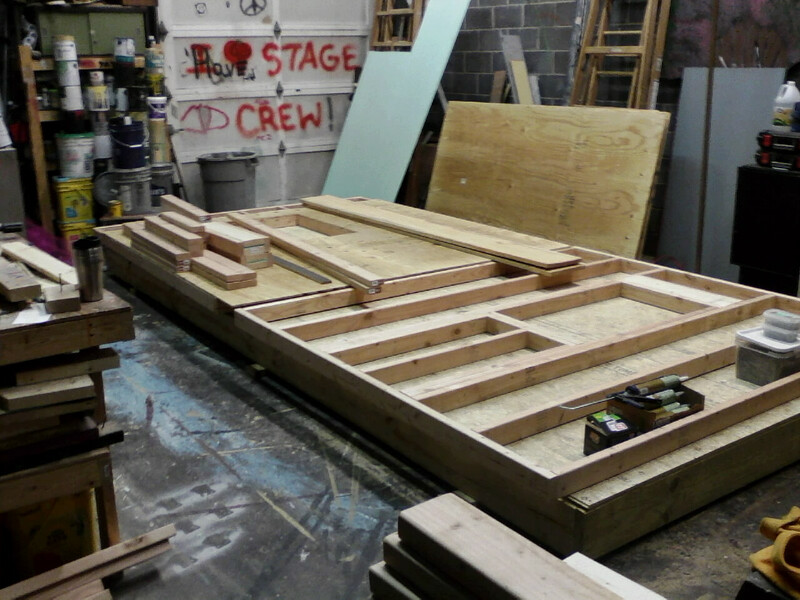 By good fortune, the spring production at school requires very little in terms of set construction so I asked if we might use the shop space to begin construction on my tiny house while using the opportunity to give the stage crew a meaningful construction experience. We got the green light from the administration, and, losing no time, I submitted a materials list to the local Lowe’s store.. and this is where we are at the moment. The plan is to build the house in components which can later be taken apart and moved to the orchard ( a 35 minute drive) later in the spring. the interior layout..
a focused and enthusiastic group of students lending a hand! so this is what 8 x 16 actually looks like.. sure is good that we get along very well! looks just like a real house! So this is what we have accomplished since Wednesday.. I was fortunate to be able to get into the shop after school on Friday and to spend a good part of Saturday ( yesterday) there by myself.. so far so good! 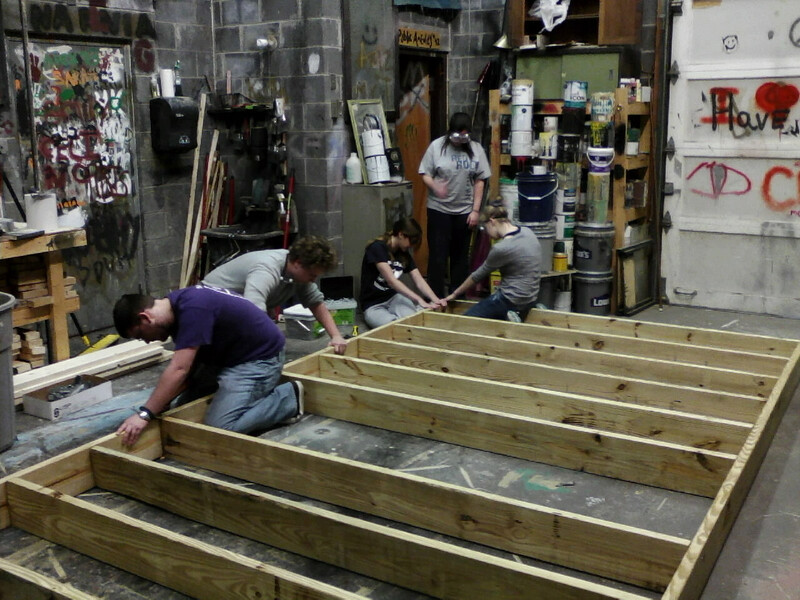 Back in September, at the very beginning of the new school year, Sarah( a student at school) approached me during our initial stage crew session and asked if I would consider chaperoning an Alternative Spring Break to West Virginia under Habitat for Humanity. This was not an off the cuff request. Sarah had already put effort into organizing the trip and had sought and received Dean Harvey’s approval, provided that she could find a teacher to go along. I was impressed with both her enthusiasm and with the level of planning that was already apparent. I was sold and ready to agree that moment, but, as every good husband would, I responded “ I will check with my wife”! We discussed the idea at home and agreed that it would be a worthwhile experience. Soon after, I informed Sarah that we were on board with the plan. Throughout the fall term, I had very little to do as Sarah periodically informed me of plans, ideas, and suggestions regarding the trip. When we became aware of the opportunity to solicit financial support from the Alumni Association, Sarah jumped on the idea, and impressed the board with her presentation. The funds supplied by the Association were appreciated and covered a significant portion of the $200 donation that each participant was expected to contribute to Habitat. With the start of the winter term, my involvement increased as paperwork needed to be signed, final costs needed to be calculated, and funds needed to be managed. Sarah and I met with the group of students who had agreed to join us during the last week of the term to review our plans. As a precaution, I asked if everyone was able to leave a day early in the event of inclement weather, and all agreed that it would be possible. There was talk of an impending storm, but it seemed like we would be well on our way before any precipitation began in the valley. As we approached the weekend, however, the timing of the storm became more of a concern, and Saturday morning we sat at home reviewing the most recent weather report which claimed that a wintry mix would arrive early the next day well before our anticipated departure of 8:30 AM. My wife and I looked at each other and agreed that we should leave Saturday afternoon. The folks at Habitat gave us the green light to show up a day early, and I quickly sent out a text to the student participants. Within an hour, we determined that we could be ready to go by 2:30 in the afternoon. Thanks to a group of supportive parents, everyone made it on time and we pointed the van south, believing that we had dodged a weather bullet of some significance! It was around 11 pm when we reached our destination. It took a little work to find our house in the dark, but when we did, we were grateful to quickly lay out our sleeping bags and turn in for the night, anxious to explore our new surroundings the next day. Sunday morning we arose to find that we were in a small neighborhood of Habitat homes. We walked into town as a group and were warmly greeted by the Pastor of a local church. She knew who we were before we introduced ourselves! After leaving her, we covered no more than 50 yards of sidewalk before we were greeted by Rose, our Habitat contact. She also knew who we were. It was at this point that we discovered that the other group who would be joining us for the week was from Marywood University! We were quite surprised to travel 8 hours south and find that we shared the same destination with a local Northeast PA university. A trip to the town grocery to stock up on food proved interesting when an elderly lady in the parking lot asked me to help her put a heavy load into her car. She opened the door and a fierce chihauhau began to bark. I asked her if that was going to be a problem, and she assured me that he would be fine. But, when I put the bag on the back seat he nipped my hand! No blood – so I said nothing to the nice but oblivious woman! After our walk into town, I led the group on a trip to visit an acquaintance of mine who happened to live in the area. He built a very unique cabin on the top of a mountain using frames from log cabins from the 1870’s. Our van would not make the trip up the mountain so we all piled in his truck and headed out on an adventure. 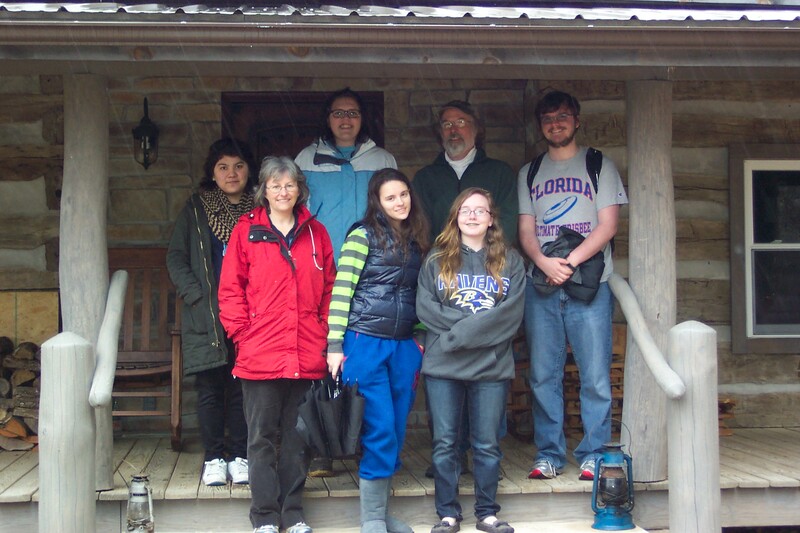 The picture is of the group on the porch of his cabin which sits right on the West Virginia / Virginia state line. After the excursion to the cabin, we joined John and his family on a trip to a local craft store and then shared dinner before bidding farewell and returning to White Sulphur Springs to meet our new Marywood friends and to participate in a group orientation. It was about this time that we learned that the storm had completely missed the valley and that we would, in fact, be experiencing some winter weather ourselves! The snow began and we found that we would not be able to work on Monday as it snowed all day! We found things to do to occupy ourselves. My wife taught some of the students to play Yahtzee, and I played a few games of Uno with the group. The day passed quickly, but we were anxious to get to work on Tuesday only to find out that the temps had fallen to near 0 degrees! We got a bit of a late start on Tuesday, but soon we were standing in a foundation hole, shoveling out dirt in preparation for laying the forms later in the week. As the day progressed, the dirt thawed and became very sticky mud. We tried our hardest to keep that out of the house, but it was not easy! By the end of the day, the shovels were becoming rather heavy. Most of the week we spent at a former Conservation Camp that had been donated to Habitat. The goal was to prepare one of the buildings to house future volunteers and that included painting, and cleaning, some dry wall work and some siding work on the exterior. The camp is located in a valley by a small stream about 10 miles outside of town. Gerald was our supervisor there. He quickly became popular with the group and taught us some of the finer points of painting. On Thursday evening, we joined forces with the 14 members of the Marywood group and prepared dinner. Some of the local Habitat families were invited, but only one family showed up. It was interesting to get to know them and to begin to understand how appreciative they were to be on the list to move into a new home at some point in the future. The Marywood kids brought a lot of energy to the house, and our kids enjoyed playing games with them. Friday night we began cleaning our house and then turned in with the expectation of an early departure. We were fairly well organized and ready to leave on time the next morning. At this point, we were all looking forward to getting home and to relaxing during the second week of break! The trip home was smooth, and, as was the case throughout the week, the company of the students was enjoyable as we made our way back to Pennsylvania. Traveling with students on community service trips has created some of the fondest memories of my teaching career, and this trip will certainly contribute to that mental scrapbook of special times. It takes a certain level of recklessness to commit to spending a week of one’s vacation with a group of teenagers. Thanks to the students involved – their work ethic , sense of humor, and willingness to be flexible, we had a wonderful time together.